The luxurious sheets, towels, and clothing at Cariloha have one surprising thing in common. Only in a futuristic, sci-fi world would you think one fiber could be spun into mildew-resistant towels, silky soft sheets, non-smelly socks, and fast-drying clothes. Well, it’s real, and it’s made from bamboo. If you’ve never discovered the brilliant properties of bamboo, that might be because Cariloha, one of the first stores to devote itself exclusively to bamboo products, has previously located the lion’s share of its boutiques in Caribbean tourist towns. Not anymore. 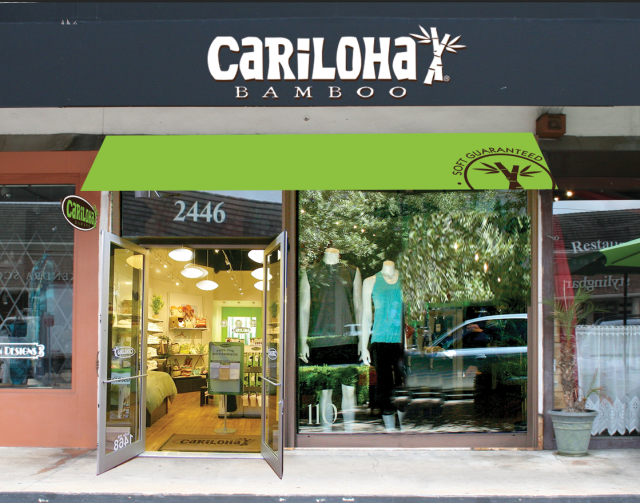 Rice Village is now home to the first Cariloha shop in Houston (although there’s a smaller hybrid shop in Galveston, too). You can now buy your bamboo sheets, blankets, clothes, towels, and more, without jumping on a plane—and chances are if you worn or used bamboo-made products, you’ll want more. The sheets are likewise heavenly, and you can test them yourself with the store’s side-by-side comparison. In addition to the super-soft texture, they are also thermocontrolled, so you stay warm in the winter and cooler in the summer. The clothes have a similar effect—Cariloha promises that you’ll stay 3 degrees cooler in a bamboo shirt than a normal cotton shirt. “To be three degrees cooler in Houston, I think that’s a big deal, as hot as it gets in the middle of the summer,” Whittington said. The products are all organic, since bamboo is never treated with pesticides—it grows about four feet a day sans chemicals—but some of them are blended with a small amount of organic cotton to make the material sturdier. The store, which has been open since November, expects to expand to offer a baby line, pillows, and lighter weight blankets. Plus each trip inside comes with a dose of the islands, with a tropical scent that wafts through the store and a bamboo lei gifted with every purchase.